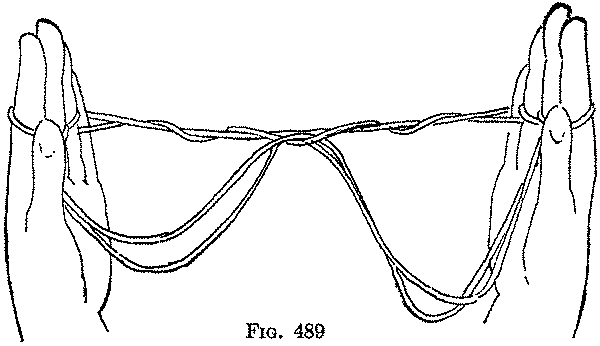 I obtained this figure from Dr. Haddon in August, 1904. He learned it from two old Navaho men in Chicago in 1901, and has published a description of it (5, p. 222, pl. xv, Fig. 5). The Navaho name is Atsinil-klish. In the Philadelphia Free Museum of Science and Art there are two examples of the finished patterns, collected by Mr. Stewart Culin, but they are so badly distorted as to be scarcely recognizable: No. 22712 is Navaho, from St. Michael’s Mission, Arizona; No. 22732 called Vo-pi-ri-dai = Lightning, is by the Tewa Indians from Isleta, N. M.
First, Second and Third: The same as the First, Second and Third movements of the "Bow." 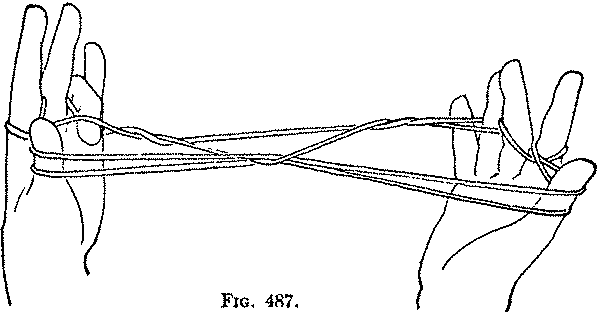 Fourth: Bend each ring finger toward you over the far middle finger string and take up from below with the back of the finger the near index string (Fig. 487, Left hand), and return the ring finger to its position (Fig. 487, Right hand). Fifth: Pass each little finger over the far ring finger string, and take up from below on the back of the finger the far middle finger string (Fig. 488, Left hand), and return the little finger to its position (Fig. 488, Right hand). You now have two twisted strings passing between the two little fingers, two loose strings passing over the thumbs and two strings laced around the other fingers. Sixth: Turn the hands with the thumbs upward and the palms facing each other. The little finger strings should be taut, but must not be disturbed. Keep all the fingers close together so that the strings cannot slip; the success of the figure depends entirely upon this precaution. Take the thumbs out of their loops (Fig. 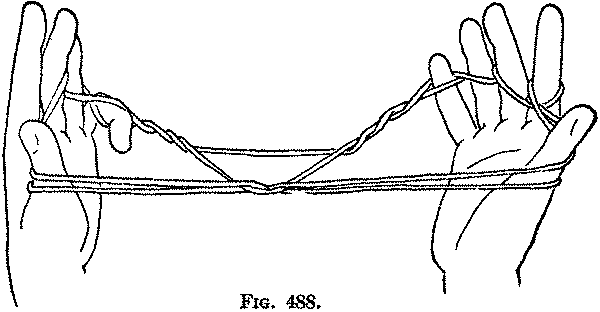 489), and throw these loops away from you over the tightly drawn twisted little finger strings (Fig. 490). Seventh: Insert each thumb into the small space between the twisted little finger strings, close to the little finger, and lift up the upper of the two strings (which is the far ring finger string). Now, if the lower string be kept tightly drawn and the other fingers be kept close together, the loose hanging strings (the original thumb loops) will become wrapped around the twisted little finger strings as these gradually untwist when the upper string is lifted by the thumb. This movement forms the figure, which should be about two inches high (Fig. 491). A better effect is produced if the thumbs lift the upper little finger string just as you toss the hanging loop over; the zigzag lightning will then flash into view. This is one of the most effective and satisfactory of all the figures, but one in which the novice is very apt to fail owing to his letting the strings slip through the fingers just before its completion. The lacing of the far thumb string and the near index string on the rest of the fingers, which is begun by the middle finger in the "Bow," is carried further in this figure by the ring and little fingers. These movements are peculiar to the "Bow" and to "Lightning."